In the third and final installment Maurice Ungless tells us about the tropical trials of the Super VC10 at Johannesburg and some other incidents which he witnessed. Click here to read the first part of his story which deals with the assembly of G-ARTA and the initial tests. Click here to read the second part of his story about the first tropical trials of the VC10. The Super VC10 Tropical Trials were scheduled to re-commence early in January 1965. On this occasion the aircraft to take the honours was G-ASGB, having been ferried from Wisley to London Heathrow for an evening departure on 8th January 1965. Six weeks after the original abandoned trials Gulf Bravo departed about 9.00PM, 3000 lbs over weight. This was to be a direct flight and a record speed attempt on the then record for London to Johannesburg. 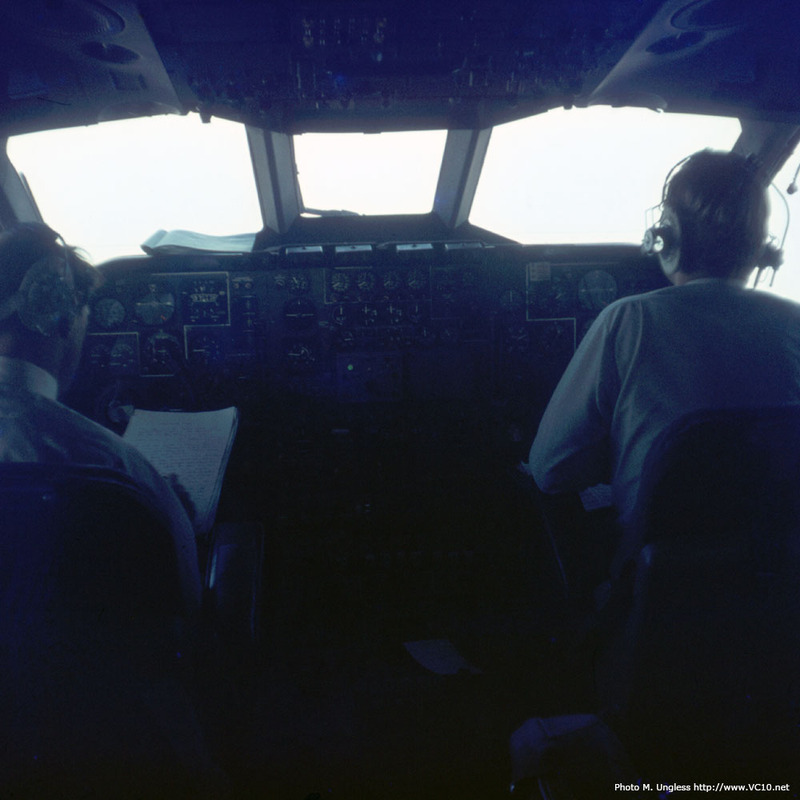 Captain Bill Cairns and co-pilot John Cochrane in G-ASGB somewhere over mid-Africa, enroute to Johannesburg for the second attempt of the Super VC10 tropical trials. 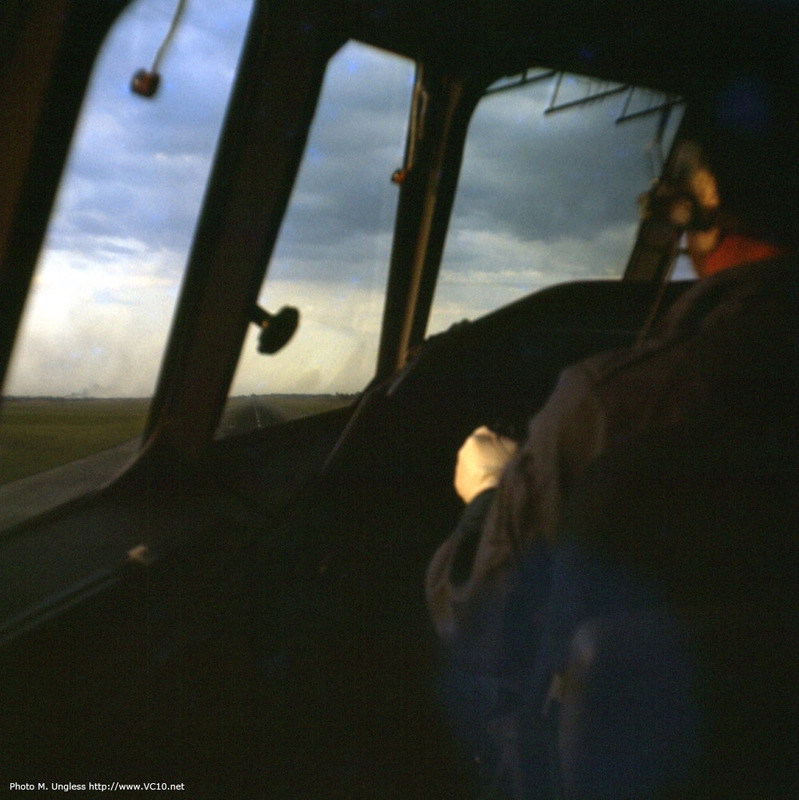 Onboard G-ASGB en-route to Johannesburg, South Africa on 9th January 1965. First VC10 in-flight entertainment, with ground crew in relax mode. G-ASGB at Salisbury, South Rhodesia (now Harare, Zimbabwe) for a quick 'splash and dash'. En-route to South Africa G-ASGB carried out the first and probably only flight of a VC10 over the Sahara Desert and definitely the only record attempt London to Johannesburg, South Africa direct by a VC10. However the planned direct flight was thwarted by high speed head winds of 90mph over the Sahara Desert, which consequently reduced our range by some margin. 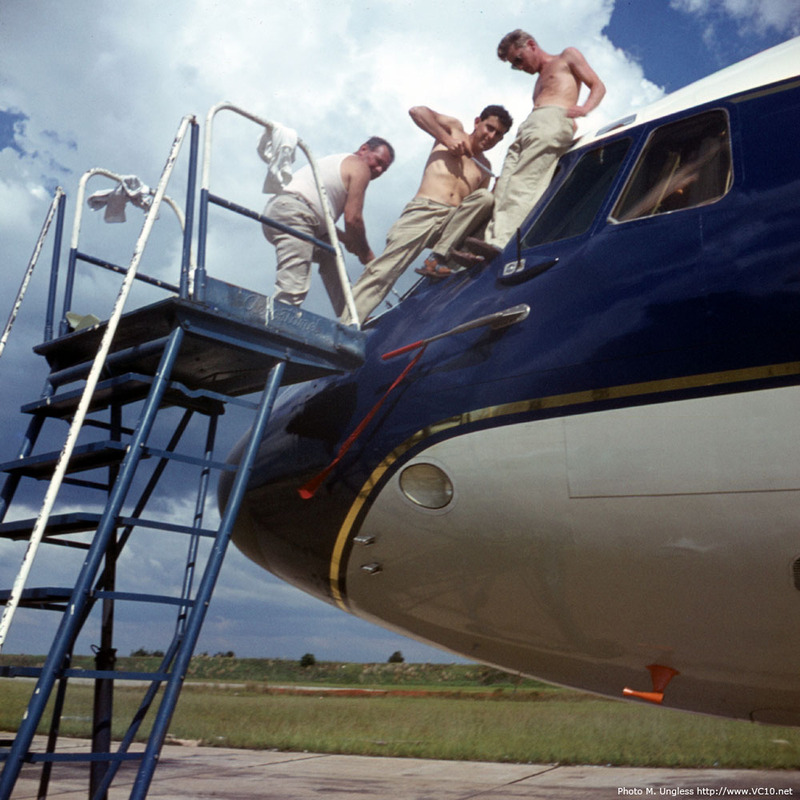 It was decided to stop off at Salisbury, Southern Rhodesia for a "splash & dash" fuel stop. This would be the first landing and take off by a Super VC10 at Salisbury, after a 20 minute stop over for fuel the flight resumed to Johannesburg. The direct flight record speed attempt failed due to high speed head winds encountered over the Sahara Desert, but on arrival at Johannesburg Jan Smuts Airport on 9th January 1965 a new record was set of something like 10 hours 15 minutes, even with the stop over at Salisbury for fuel. Incidently this would also be the first and only flight of a VC10 direct from London to Salisbury, Southern Rhodesia. Fitting the tail proximity arm to the tail of G-ASGB, author on the right. Captain Bill Cairns performing the Velocity for Minimum Unstick runway trial. G-ASGB on the runway at Johannesburg Jan Smuts Airport during the Max KE stop trial, note smoke and heat haze behind the aircraft from the overheating brakes. G-ASGB spent several weeks on Tropical Trials at Johannesburg Jan Smuts Airport, South Africa. One of these trials was the VMU runway trial. (Velocity for Minimum Unstick). 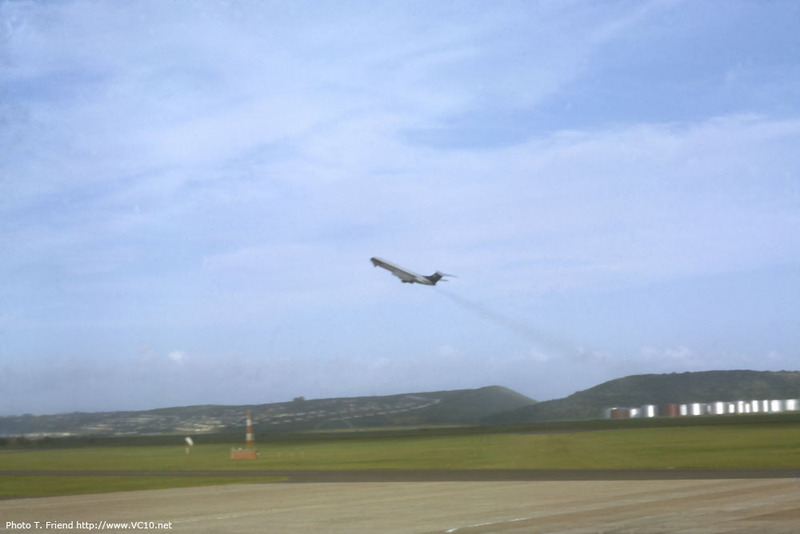 The trial consisted of rotating the aircraft prior to the recognised VR speed and holding the aircraft in that attitude until lift off and climb out. The resulting lift off speed was then recorded as the minimum speed where liftoff could be achieved. This trial was carried out several times at different Take-Off weights and a chart built up for inclusion in the VC10 Flying Manual. 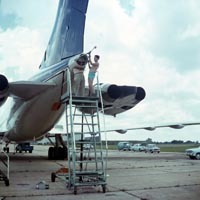 The equipment that can be seen being installed by the author (photo above) at the tail end of Gulf Bravo is a tail proximity arm. The arm had two micro switches which were activated when the attitude of the aircraft had nine inches and three inches between runway and installed wooden tail skid, fitted to the orange brackets on the fuselage rear belly. The brown wood skid block can be seen laying on the ground awaiting fitting. The pilot, Bill Cairns, had two lights on the flight deck to indicate the distance between the runway surface and wood skid block. I cannot remember the skid ever having marks of contact with the ground, an amazing piece of flying skill. The second important runway trial, also similar to the ones carried out at Torrejon and Johannesburg on the Standard VC10, was the Max. K.E. Stop (Maximum Kinetic Energy Stop) or High Energy Stop. This trial was carried out with the aircraft at Max Take-Off weight and using Max braking effort from V1which resulted in the brakes becoming white hot. To prevent the tyres exploding with higher pressure due to heat soak and temperature rise within the tyre, the fuseable plugs in the wheel hub melted, thereby deflating the tyres. The fuseable plug temperature rating had already been upgraded to a higher value of temperature before melting to delay tyre deflation for this trial run. The photo above shows the smoke haze emanating around the aircraft from thrust reverse and brakes smoking. On this occasion, unlike the Standard VC10 trials at Torrejon, the aircraft was stranded on the runway with eight deflating tyres. We the ground crew however were ready with equipment on a flat bed truck and were on the scene soon after the aircraft came to a halt. De-fuelling immediately commenced, stirrup blocks put into place and stirrup jacks engaged before the tyres completely deflated, to prevent the weight of the aircraft being bourn by the wheel hubs. We had only a finite number of hubs but plenty of spare tyres. Had the weight been placed on the hubs they would have had to go through a lengthy servicabilty check in the workshops. To say the least every trial of this nature was fraught with impending danger of injury, having to approach an overheated wheel and tyre and white hot brake units. As pressure was being released from tyres we were between two lethal entities, attempting to fit stirrup blocks and stirrup jacks to the bogie beams, before the aircraft settled on the wheel hubs. And to boot, defuelling operations were being carried out at the same time. There was no time to loose, we were blocking the only runway at Jan Smuts Airport, Johannesburg. We had the eight main wheels and brake units off within an hour and new wheels on in about the same time, but no brake units. We were brakeless again for the tow back to base. The runway had to be cleared as soon as possible. The author in the middle changing the captain's flight deck window on G-ASGB after a bird strike during flight trials with Colin Donaldson on the right and Dennis Collier on the left. Crowds welcome Super VC10 G-ASGB at Durban Airport during a day trip for hot ambient engine ground running trials. Captain Bill Cairns at lower left corner of the photo. G-ASGB arriving at Durban Airport. On 31th January 1965 Gulf Bravo went on a day trip to Durban from Johannesburg for hot ambient engine ground running trials. 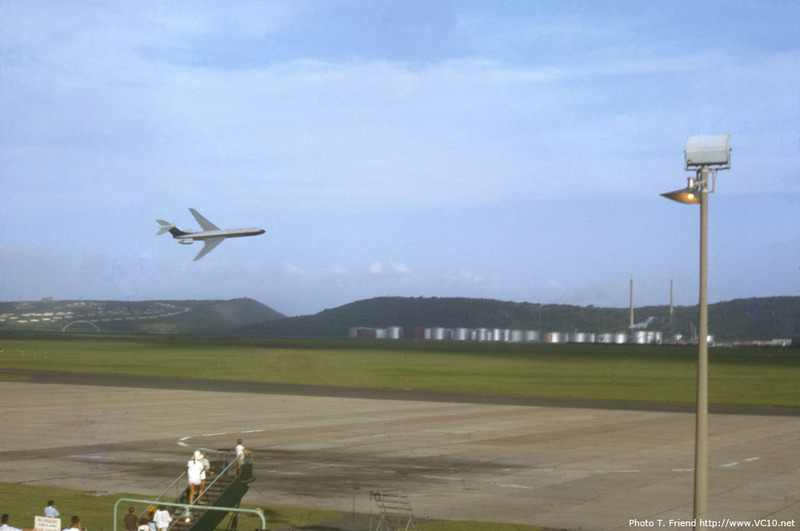 I believe this was the first and only flight of any VC10 to land & take-off from Durban Airport South Africa. Upon arrival at Durban Airport we were met by Farnborough Air Show like crowds welcoming the first pure jet powered aircraft to land since the early days of the deHavilland Comet aircraft that used to fly the route in the fifties. On this flight we also gave a one way lift to Durban for the then up and coming South African golfer Garry Player. Bill Cairns had also taken his golf clubs on trials!!! On take-off for the return trip to Johannesburg Captain Bill Cairns carried out a typical VC10 near vertical take-off to entertain the crowd and then proceeded to carry out a low level run over the Indian Ocean parallel with the shore line of Durban, which seemed only a few feet above the waves. The aircraft then entered into a tight turn with the wings almost vertical, which when looking out the cabin window down the length of the wing looked like the wing tip was about to collect some sea weed. That was an amazing manouvre and was probably the lowest any VC10 in flight has got, you cannot get any lower than sea level without the obvious. Certainly over the Indian Ocean at any rate. In the early 60’s jet aircraft were a rarity in Durban as SAA had yet to start operating Boeing 727s on the domestic routes. The only time jet airliners would come to Durban was when they had been diverted from Jo’burg because of bad weather. 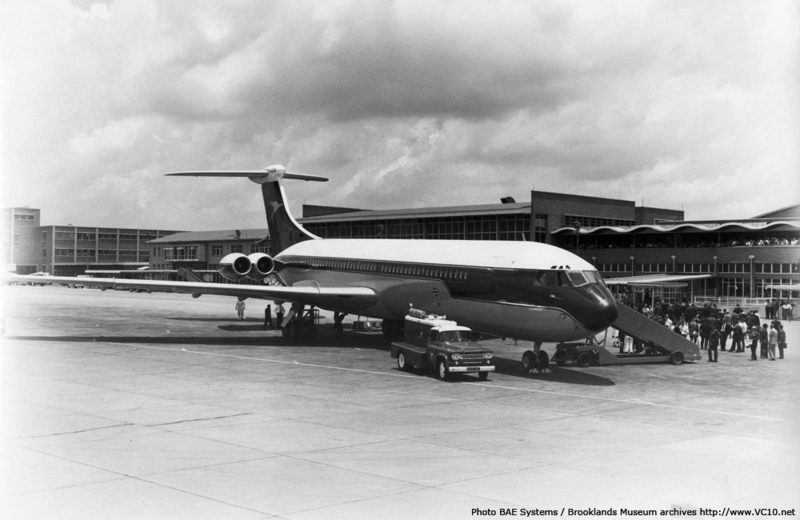 Incidentally, the first jet airliner to visit Durban was a Comet 2, piloted by John Cunningham, which was in SA for “hot and high” trials based at Jo’burg/Jan Smuts airport. 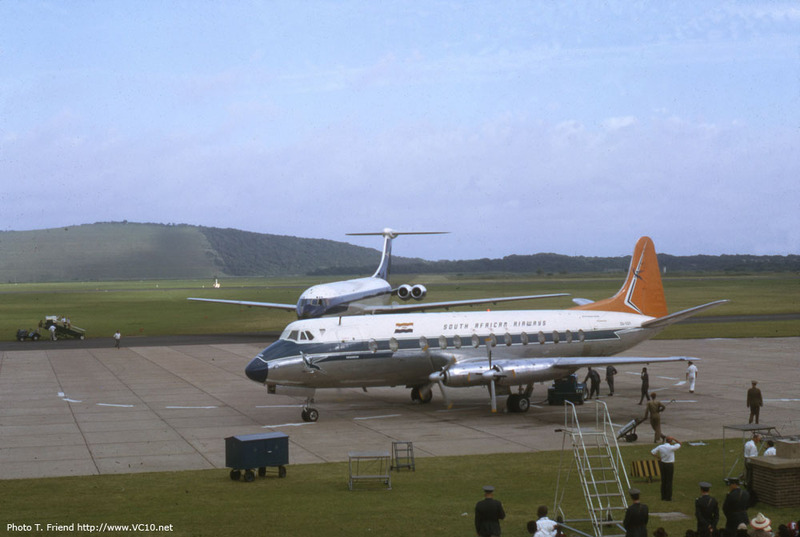 It landed at Durban/Reunion airport on the new concrete runway on 01/02/1954 and stayed overnight. The following day, after making a low flypast over Pietermaritzburg, it flew on to Cape Town/SAAF Langebaanweg. By the mid 60's I had developed an interest in aviation and shortly after returning from our Cape Town holiday we heard that the BAC Vickers Super VC10 was going to visit Durban. The aircraft had come to SA in January 65 also for “hot and high” trials based at Jo’burg/Jan Smuts airport. 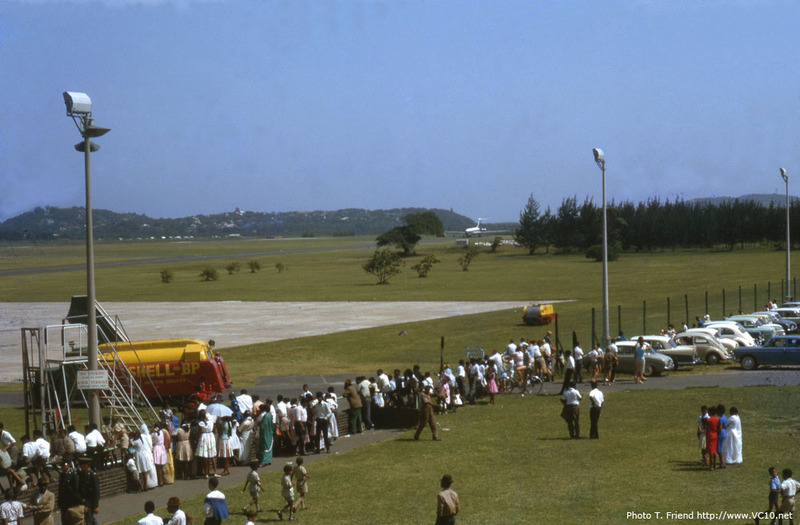 A visit to Durban for VIPs as well as a few additional tests had been arranged and once news of the visit had spread, Louis Botha airport at Reunion became packed with cars and people. 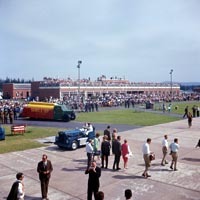 We arrived at the airport (it was on Sunday 31/01/1965) some time after the Super had landed but still managed to get parking and a place on the observation balcony. We then waited for something to happen but the Super was parked some distance away on the taxiway and there was not much to see. A few SAA Viscount & Skymaster aircraft came and went and then finally the Super taxied back to the apron to load up the VIPs. A short time later it taxied out to the runway and took-off from the Toti end towards Durban. Bill Cairns was the test pilot on this particular flight but it was very dramatic as he had decided to give us a brief demonstration. He climbed very steeply for a few hundred feet before levelling off and banking sharply around the airfield boundaries over the oil refinery back towards Toti and then back over the middle of the airfield in front of the terminal before heading off to Jo’burg. My father took several pictures and I still have these to remind me of an unusually exciting Sunday afternoon. Well how about that, I've been classed a VIP for the first time in my life. To my knowledge there were no VIPs on the flight, and the reason for the visit to Durban was high temperature engine ground running trials, not to give VIPs a jolly ride. SAA were never interested in the VC10 so what was the point. We did give a lift to Garry Player one way but that was all. The date given also maybe a little out either way as strangely enough that is my birth date, but year 1939 and on that day we had a function, (for want of another word), at the hotel in Johannesburg, The Skyline Hotel in Hillbrow. G-ASGB taxiing past SAA Vickers V.813 Viscount ZS-CDY 'Gemsbok'. G-ASGB at Durban Airport turning on the apron in front of the terminal building. G-ASGB at Durban Airport on the apron in front of the terminal building. Engine runs complete, G-ASGB departs again from Durban Airport. Taking advantage of the aircraft's low weight and excellent performance, Captain Bill Cairns performs a steep climb out. G-ASGB is then turned around and performs a low level flypast over the airfield. G-ASGB turning low over the airfield at Durban, South Africa. 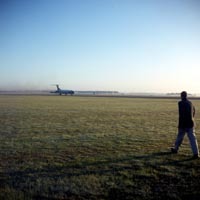 I know of one photo of the VC10 landing at Johannesburg, cannot be sure whether Standard or Super, but it was on the front page of a Johannesburg newspaper and was an image taken from the opposite end of the runway to landing end just on touch down. With the heat haze and mirage effect it looked like a bat with long legs. I had a copy but failed to bring it home. I wonder if it still exists in an archive somewhere. On return from Durban a few days later we departed Johannesburg for a flight to Nairobi, Kenya, en-route for our journey back to the UK, this again was another first. It was the first flight of a Super VC10 from Johannesburg to Nairobi as well as the first Super VC10 to land and take-off from Nairobi Airport Kenya. 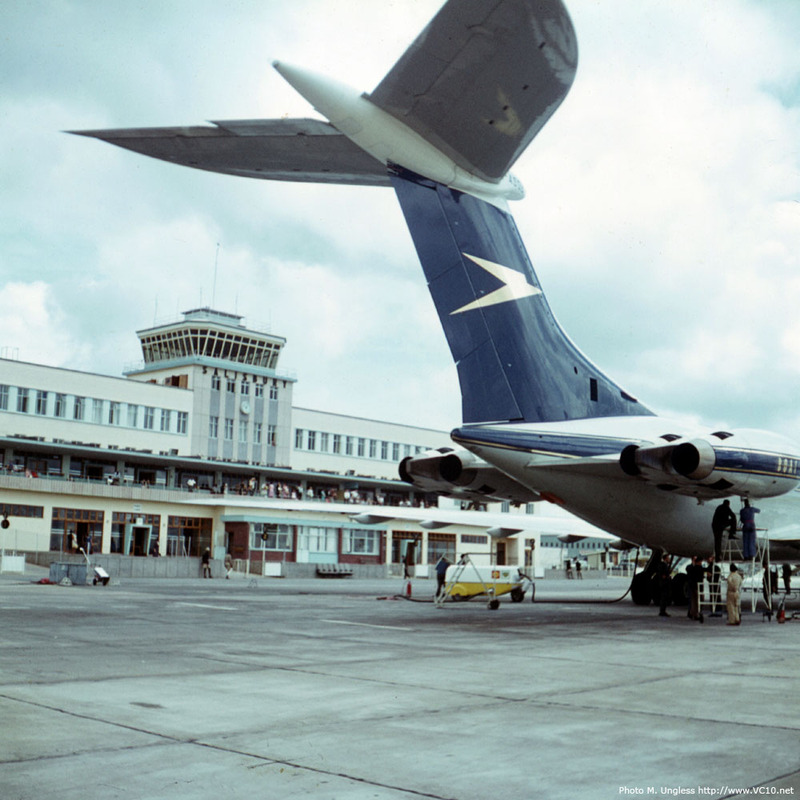 This stop over at Nairobi was to demonstrate the Super VC10 to East African Airways management and staff, who were about to order a number of Super VC10s. Soon after this last take-off from Johannesburg, an engine had to be shut down due to loss of engine oil. On arrival at Nairobi a three-engined landing was carried out, and that I believe was one of the only, if not the first, in flight engine shut down due to an engine problem during all the VC10 trials. The Conway was and probably still is a very good and reliable engine. The defect causing the oil loss was not an engine related defect as such, but a leaking oil transfer bobbin to the Godfrey Cabin Air Compressor. There was no quick fix, and I don’t think we carried spares for this at any rate. Also we were not about to divulge a problem to the prospective customer. After attending the lunch and reception given by East African Airways at Nairobi Airport, we again boarded Gulf Bravo for our journey back to the UK after replenishing the engine oil tank. Three engines were started on the apron and the problem engine was started at the last minute on taxi out for take-off, then shut down immediately after take-off and climb out. The flight in fact was a three engine ferry back to the UK, landing at Wisley on three engines. So another first for Gulf Bravo was being the first and possibly only VC10 long range three engine ferry flight of 4,240 miles. East African Airways placed an order a few months later in April 1965. G-ASGB seen at Wisley in October 1964, it would still be in these colours in early 1965 during the tropical trials. The Valiant in the background is most likely the single example that was flown back to Weybridge for spar strengthening modifications, only to be scrapped when the Labour government decided to cancel the program in January 1965. G-ASGB at Johannesburg during the tropical trials, although it carries the full BOAC golden speedbird scheme, the letters BOAC have been omitted from the front of the cheatline. 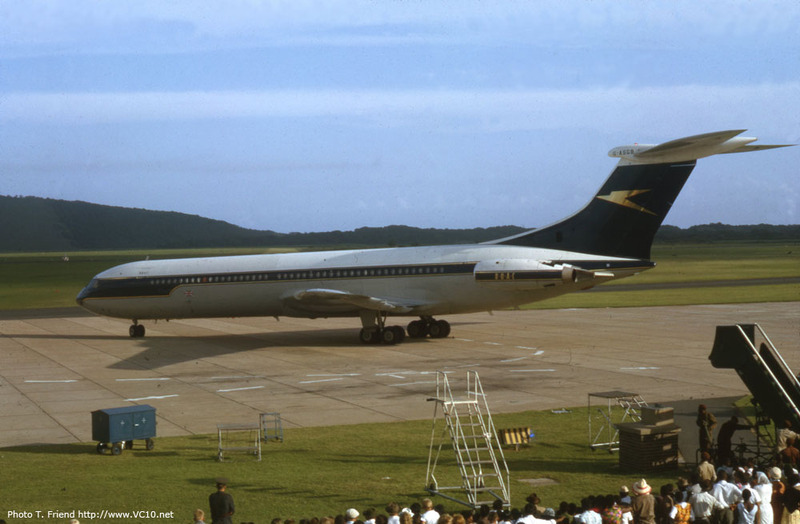 The scheme was changed just before the Super VC10 entered service with BOAC. One of the last trials I was involved in with the Super VC10 was at Boscombe Down where we had been deployed for a noise abatement trial on the Super VC10. Bifurcated jet pipes had been fitted to all four engines and we were deployed at the area of Boscombe Down where the nuclear defence bomber force were normally deployed to on occasions of high alert status. 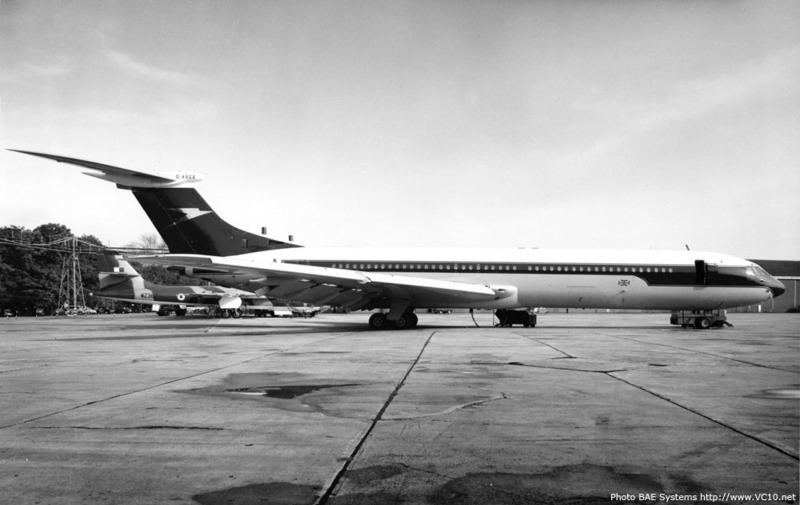 The Super VC10 would take-off at max take-off weight, carry out a circuit, then land again. Noise abatement observers would monitor the noise at predetermind locations on the flight path. As the aircraft was above maximum landing weight every time, the aircraft had to be put down like a feather on the runway. Captain Bill Cairns did this every time, what would you expect otherwise, he had that midas touch for the VC10, as he did on all the trials abroad we carried out. The aircraft would be taxied in after every landing, engines remained running and Tim, the Dunlop representative, would check the tyre temperatures for satisfactory safe take-off again. This procedure was carried out several times, but the bifurcated jet pipes were never used in service. A BOAC Super VC10 (probably G-ASGG) and a Royal Air Force Transport Command VC10 (probably XR806) in a darkened hangar at Wisley late 1965. 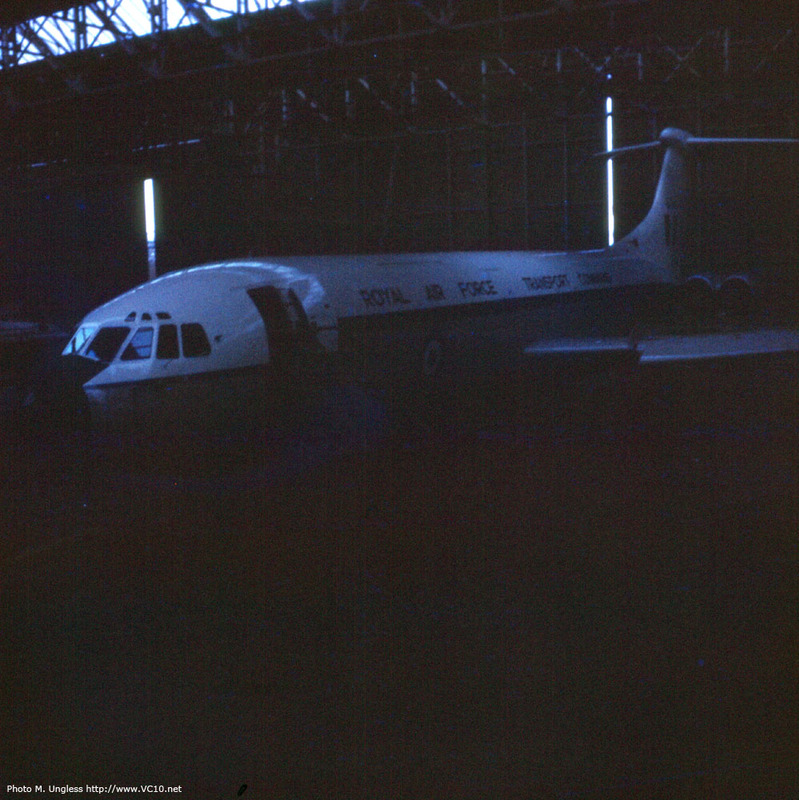 Most likely XR806 in a dark hangar at Wisley circa late November or December 1965. My last involvement as far as the VC10 at Wisley was concerned, was to be part of the ground crew in the recovery of a stranded RAF VC10 (presumably XR806) at Stansted airport, where in those days just a few Nissen huts were used as passenger terminals. The VC10 had been on a RAF flight crew training flight at Stansted prior to entry into service, having flown out of Wisley for the day's training exercise. However after numerous take-offs and landings, (circuits and bumps), at Stansted, one brake unit had seized after landing and the aircraft was left stranded on a taxi way. An engineering group was put together hastily at Wisley with spares and we were flown over by Brian Trubshaw (Trubbie) in G-ARTA. On disembarking and spares off-load Trubbie flew G-ARTA back to Wisley and left us at Stansted to repair the RAF VC10. We were flown back to Wisley by the RAF crew and during this flight training carried on as stall recovery training was carried out. That was a first for all the ground crew involved that day on a VC10. Normally only flight crew would be on board for such trials or training exercises. 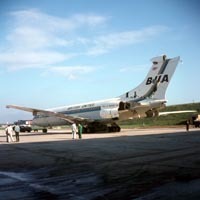 BUA VC10 G-ASIW during rectification work at BUA Gatwick circa October 1966. Installing the repaired horizontal tail on G-ASIW. 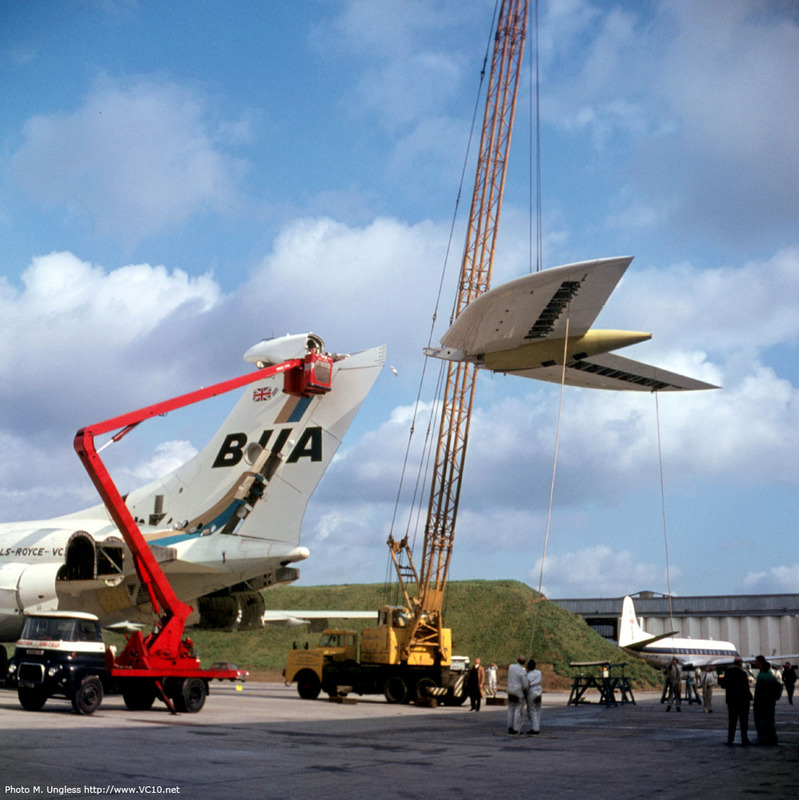 BUA VC10 G-ASIW was meant to be transporting Prince Phillip The Duke of Edinburgh to Brazil on a state visit during early/mid October 1966 and BUA were carrying out an aircraft service in a hangar prior to releasing the aircraft for the Royal Flight. 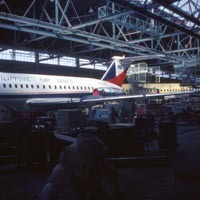 On de-jacking the aircraft in the hangar the aircraft became dislodged from the rear jack and the jack pierced the fuselage structure around the jacking point. As the tail plane settled on to the surrounding docking it also sustained damage. A working party from BAC Weybridge was sent to Gatwick to assist in the repair. This was my last assignment with BAC as I left employment circa 20th October 1966, joining BEA on 22nd October 1966. The problem with this accident was the fact that the VC10, whether Standard or Super, was very difficult to de-jack as anyone who has been involved in de-jacking a VC10 would confirm. If the aircraft is de-jacked in a normal longitudinal level attitude, stand by for a problem. This is due to the close proximity of wing main jack's locations and the undercarriage main oleo strut, a matter of only approximately 6 feet from memory in a forward/aft direction. The C of G is somewhere between the 2 points depending on fuel loading and locations and as the aircraft is lowered the load transfers very quickly in the later lowering stage from jack to undercarriage. With stickture of the oleo ram gland seals the undercarriage oleo strut makes a series of sudden compression and rebound movements, much like a shock absorber, which it indeed is. The problem is also compounded by the fact that the undercarriage oleo strut is not vertical with the ground but raked back at an angle, so the ram is being slid into the oleo casing at an angle but the aircraft is descending vertically, which doesn’t help matters. There is a point that the aircraft load is increasingly being transferred from main jacks to undercarriage oleo. This condition can bring about a longitudinal rocking motion between the two and hence detachment of the rear jack from its jacking pad located on the aircraft rear fuselage side. As the aircraft rocks back down again the two may not re-align and hence sometimes the jack subsequently misses the jacking pad on rebound and penetrates the fuselage, if you are unlucky. Also fuel placement within the individual tanks is another criterior to be considered i.e. where is the C of G? Is it within an acceptable range of load and position for a jacking operation, or de-jacking, or should fuel have been added after jacking? There are so many criteria and variables to be considered in raising and lowering an aircraft. VC10 lowering should, and always was at Wisley, carried out with the nose jack removed. This was found out during the very first lowering of G-ARTA, carried out in the Cathedral at Weybridge after completion of assembly and before engine ground runs were carried out prior to first flight, as previously mentioned earlier in my memoirs. I have issues with both versions of events during that incident with G-ASIW at Gatwick that have been voiced by previous donors of information or opinions (click here to read these stories). Although I wasn’t present when the incident occured (I was during the period of repair at Gatwick) I can only voice an opinion of someone who over 4 years had considerable experience of raising and lowering VC10s at Wisley and abroad. Firstly even if the brakes had been left applied during lowering, and I don’t know whether they were or not, the undercarriage bogie beam would be tilted rear down in its normal trailing condition with load off wheels, that is if it was in a fully raised condition to carry out undercarriage functions. The two rear wheels would impact the hangar floor first on lowering, this would not initially be a reason for concern in the scenario of brakes applied as all the weight is still very much on the jacks and none on the undercarriage. I would have thought some juddering or screaching from the rubber on the hangar floor with the wheels unable to turn would have alerted those on the nearby wing main jacks to the noise and re-coup the situation and remove the application of the brakes. However lets assume the brakes were left on. As a Licensed Aircraft Engineer I’ve been either involved, observed or supervised raising and lowering of aircraft over the last 50 years (I’ve been retired for 10 years, so make that 40 years experience) on many aircraft types, whether it be at Vickers, BEA or British Airways. VC10s, Vanguards, Viscounts, Comets, Tridents, Concorde, B767, B757, B747 and L1011 Tristars, the VC10 is or was the most difficult. During these practices it is paramount that brakes are released soon after the initial weight of the aircraft has been taken by the jacks, but still firmly on the ground prior to raising. Also it is paramount to release the brakes before lowering commences, with wheel chocks set a small distance from the tyres to prevent the aircraft rolling once on the ground, but also so they do not get jammed under the tyre on fully lowering. Usually if brakes are left on during lowering and there is a build up of tension in the tyres to the extent of pushing the aircraft one way or the other, this will occur to all jacks as the load is completely released from the jacks. There were a few incidents of that nature in lowering L1011 Tristar aircraft at British Airways with minor damage to the lower wing panel. The point I am attempting to make is the unlikely contribution to the incident of lowering the aircraft, with brakes on, that would cause only the rear jack to become detached from its pad. If that was so, why did not the main jacks also become detached at the same time? No in my opinion it is the classical example of rocking between main wing jacks and main undercarriages as the load transfers in the later stages of lowering, which is inherent in the VC10's de-jacking operation, which can only be prevented by using the procedure we adopted at Wisley. This meant allowing a nose down attitude in the intial stages, such that the rocking can be prevented. Sadly on this occasion there was not enough good supervision to prevent this happening, and was very probably embarressing for those involved. As far as scrapping the aircraft "had it pierced the main frame". Usually aircraft are not scrapped after an accident unless they are uneconomical to repair, and there is always a repair scheme, believe me. I’ve seen, been aware of, and been involved in some very large repairs to aircraft. Anyway the jack head would have probably slid by the frame perhaps making a mark but hardly doing too much damage. The frame after all is a substantial frame which is capable of taking rear jack loads, the only damage I think here is reputations, and the fuselage skin and perhaps a stringer or two. 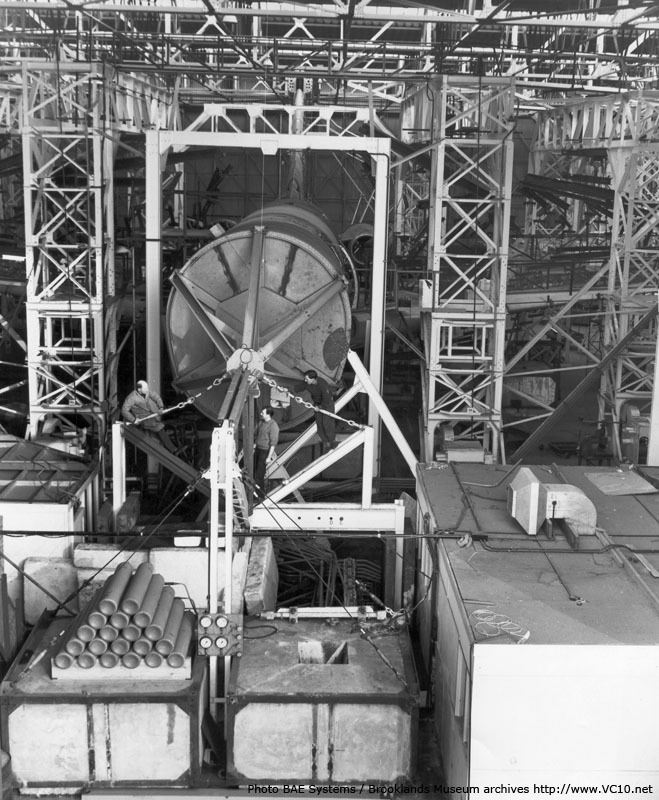 The test fuselage in the static test rig at Wisley with the monitoring room at the right. Front view of the test rig showing the steel bulkhead closing off the front end of the fuselage. With regard to the VC10 Static Test Rig at Wisley which comprised the fuselage (without front section), engine nacelles, wings and fin. The fuselage had a steel bulkhead attached at the forward open end to complete and seal the test fuselage. 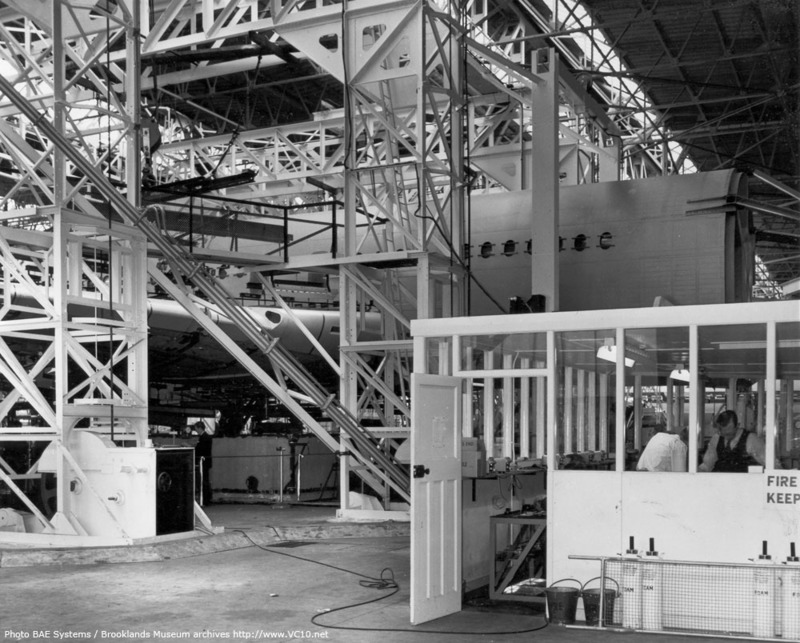 The fuselage was filled with blocks of polystyrene to capacity to reduce the volume of air within the fuselage. This was in case there was a sudden rupture of the fuselage during test cycles as it was in a confined space of the hangar. Had the fuselage structure suddenly failed, under maximum cabin pressure of something like 10psi, and great volumes of air had been expelled suddenly, the roof of the hangar would have been blown off. 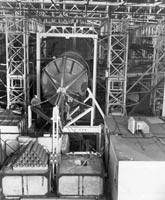 The complete envelope of aircraft cycles were carried out for many months continually, the hangar reverberating to creaking sounds either from the aircraft structure or the test rig equipment. There was a large indicator board at the end of the port wing on the rig structure with information of flight cycles, flight equivalent hours and particular cycle the aircraft was in. It was fascinating to watch. The cycles even included refuelling, pulling the wings down as if fuel would be loaded. The wings were then being vibrated up and down as if on the runway on the take-off run, then the take off cycle pulling the wings up as the aircraft load was taken by the wings. Then cycles of in-flight fluctuations of wing deflections up and down, including sudden gusts encountered during flight, either up or down. 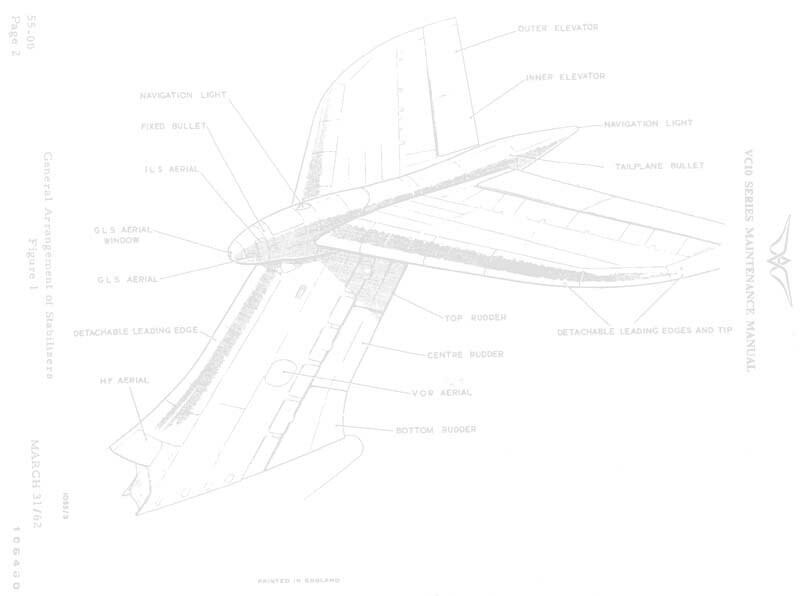 Included in this was the extra deflection of the wing upwards as the fuel load decreased. Then finally the landing whereby the wings would be pulled down on the aircraft's perceived impact on the runway, plus a heavy landing now and again. During all these fluctuations of the wings, the fuselage pressure cycles for take off, cruise and finally landing would also be carried out. Finally after all the cycle tests had been completed over many months to something like the expected life of the airframe of many tens of thousands of hours (I think the initial life was set at something like 100,000 hours plus), the ultimate load test was carried out during which the wing was expected to break somewhere. This actually didn't occur. The wing was so strong in design that the ultimate load test was exceeded without breaking and the wing could not be pulled up any further due to the hangar roof limiting the height of the test rig structure. I was an apprentice in my 3rd year when the Vanguard wing and structure went through a similar series of tests at Wisley, I was present on that occasion and witnessed that wing breaking after the ultimate test had been achieved with an almighty "BANG" and the complete test rig shuddering. Brian Trubshaw having an accident with Vanguard G-AOYW by striking the port wing tip on the small hangar door support extension on taxi out at Wisley, causing considerable damage and fuel flowing everywhere. This was after the ground crew member had waived him off for taxi out. I remember "Trubbie" getting out absolutely disgusted with himself and walking off across the taxi way and up the path across the runway in isolation to the control tower and pilots office. 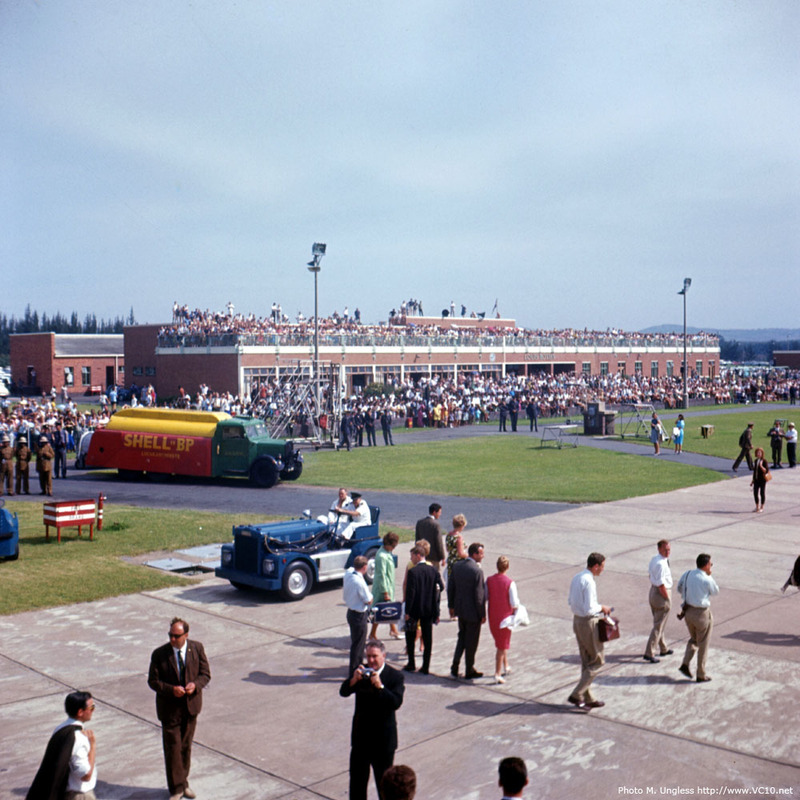 This was circa 1961. (I bet that wasn’t in his memoirs, best forgotten). Brian Trubshaw landing a VC10 at Wisley. One day we were stranded at Boscombe Down with a VC10, we could not return to Wisley as a BAC 1-11 had crashed on the runway there. A "Safari Bus" was deployed to Boscombe Down to collect us. By the time we got back to Wisley it was dark and cranes could be seen raising the aircraft under arc lights. The next day I went to inspect the BAC 1-11 in the hangar and had a look inside. Where as before entry into the flight deck was a simple matter of walking in, now a step up was required. The left engine was detached from its mount, just hanging by service ducts and cables. The tail plane was bent down, the whole aircraft was severely damaged and written off. We recovered the stranded VC10 either the next day or the day after that. This incident with the BAC 1-11 was before the modification of the elevator controls which were servo tab operated at its inception. Later these were modified to power controls with manual servo tab operation as a manual reversion. 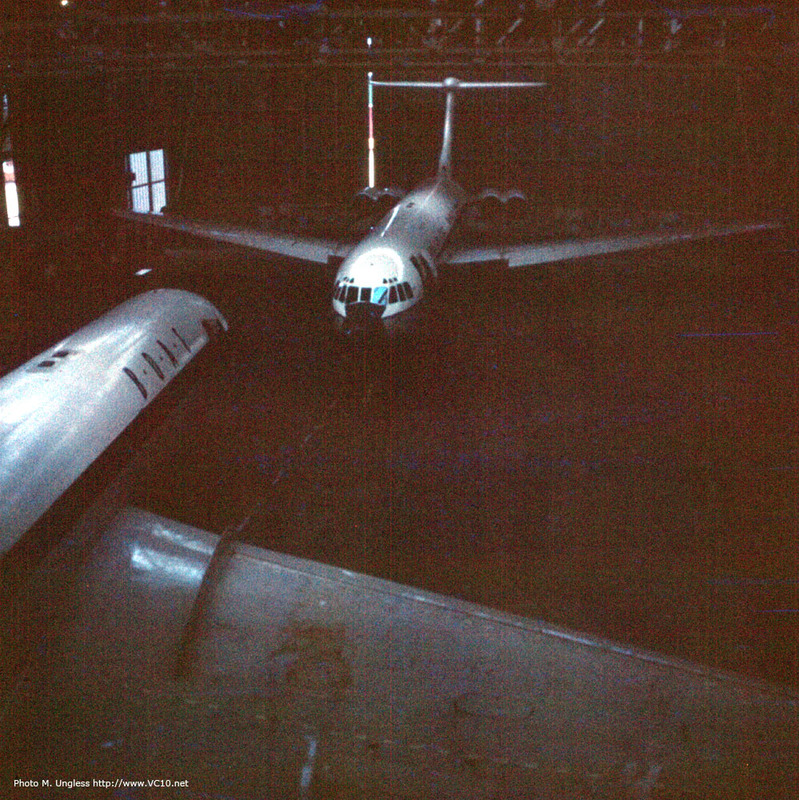 All three BAC 1-11 crashes were caused by the original servo tab operation of the elevators. I believe the pilot on this occasion was Peter Baker who got an Air Pilots Commendation for getting the aircraft on the runway as it was out of control some miles out. I believe Peter Baker was the co-pilot on the first and second tropical trials of the Standard VC10 G-ARVB at Spain and South Africa. He was re-deployed to BAC 1-11 testing after the accident to G-ASHG (the crash of the prototype on Salisbury plains). On this occasion, from eye witness accounts, the aircraft struck the runway in a nose down attitude shearing the nose landing gear off, hence the step up into the flight deck. The main landing gears next contacted the ground and sheared off, I believe it was the left engine that sheared its mount but remained attached to the aircraft by services and ductings etc. The tail plane was bent down on both sides. The aircraft remained on the runway and ended up opposite the control tower (about half way down the runway), facing the opposite direction having turned 180 degrees in its voyage down the runway. Escape windows in the cabin apparently started to open before the aircraft came to rest by all accounts. All on board were uninjured except for a few bruises, and a bit of dampness. The BAC 1-11 apparently was a pig to fly below 8,000ft, absolute heaven above. Peter Baker I believe was also at the controls of the BAC 1-11 that crashed on Salisbury Plains at approximately 30 mph. Having believed he had entered a deep stall condition he deployed the tail chute to recover. However for some reason he could not then release the tail chute, and flopped onto Salisbury Plain at something like 30mph doing little damage. 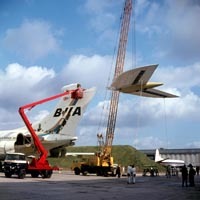 The aircraft was later retrieved by disassembly and reconstructed and put into service with BUA (this same airframe later became XX105 with RAE Bedford). 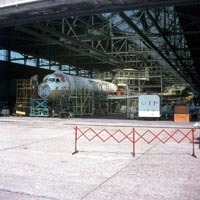 BAC 1-11s in final assembly at Weybridge. 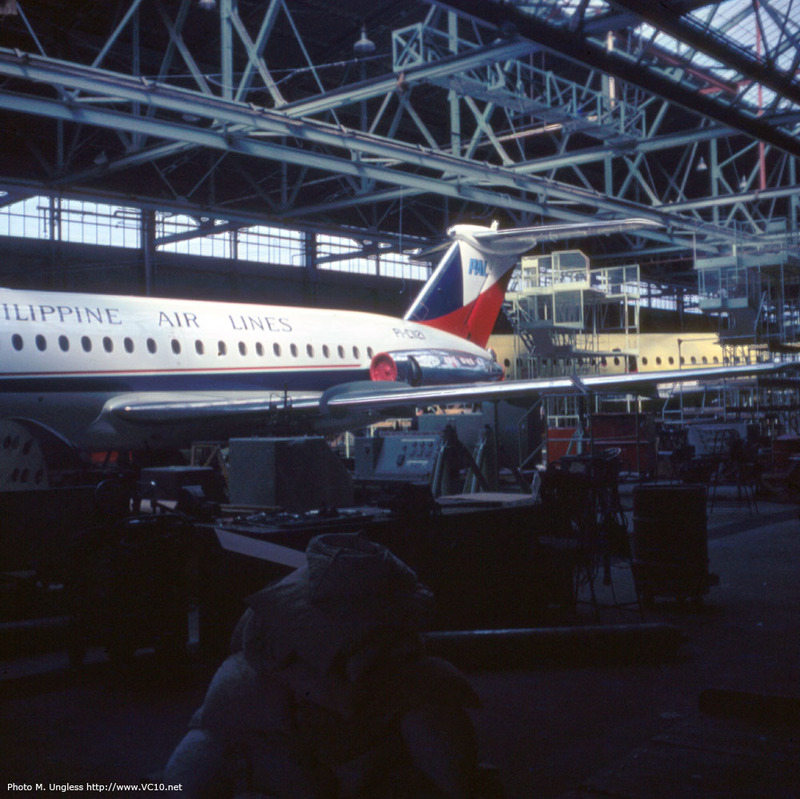 A BAC 1-11 for Phillipine Air Lines nears completion at Weybridge. 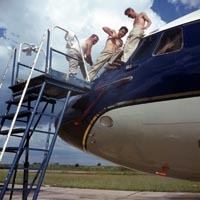 I was also a witness to Freddie Laker's Rolls Royce being loaded onto his first VC10 for an inaugural trip to Entebbe. The flight had to have a BAC ground crew member accompany the aircraft to manage the closing and opening of the side cargo door, as in those early days there were some problems in closing and opening this door. The colleague, Maurice Barney, who accompanied me to the Kano incident had expert knowledge of this and was chosen to go with the aircraft on that occasion. As I remember it the Rolls was an immaculate white. Sometime in 1965 I was in the hangar at Wisley when a tornado hit the airfield. Actually I've just looked it up on the internet, to be exact it was 21st July 1965 at 15.45 hours. The tornado first travelled across the Royal Horticultural Society Gardens at Wisley, across the then single carriageway of the A3, entered the airfield through the trees and went across the back of the large hangars with the VC10s parked for re-furbishment or maintenance, presumably an ex-trials VC10. Fortunately there were no aircraft outside, just the aircraft tug. I was on the top level of the tail plane staging, below and working on the tailplane of a VC10 some 50 odd feet above the hangar floor, on that side of the hangar a matter of 10 feet from the closed hangar doors. The first thing we heard was the airfield siren, normally associated with an aircraft landing emergency incident alert. Suddenly all hell broke loose, the hangar door steel corrugated panels were being ripped off the hangar door structure within only 10 feet of those on the staging. We were unaware that it was a tornado, thinking the worst of an aircraft crashing. We ran down the staging access stairs like mad men, a mere matter of about 10 individual ladders between stages, across the hangar floor and out the hangar on the other side. Standing outside, we then observed the tornado emerging down the runway with parts of the hangar door panels, branches of trees and the aircraft tug engine bonnet all whirling around crazy like, disappearing eastward. My only commercial flight in a VC10 was from the UK to Sri-Lanka for a holiday on 17th March 1974, leaving from Terminal 3 at Heathrow with my wife and 2 year 8 month old son, by way of my entitlement to airline staff travel, another free flight. I worked for BEA and was entitled to staff travel with them, and moves were about for both BEA and BOAC to join as British Airways so both sets of staff of the individual airlines were entitled to all routes eventually. In nearly fifty years of travelling I've only paid twice for flights, other than taxes etc over recent years. The route to Sri-Lanka took us to Cairo as a first stop, thinking I've been here previously some 11 years before on another kind of flight. We weren't allowed to leave the aircraft for security reasons, G-ASGO Amsterdam Schiphol 3 March 1974 had just occurred and we actually wondered beforehand about the advisability of this journey, but hey ho, off we go into the unknown. Next stop was Bahrain, again not allowed off the aircraft. Here there was an hours delay as the forward cargo hold door seal had been damaged and repairs had to be effected. The next stop was supposed to be, I believe, Bombay but as no passengers were to be disembarked or embarked at Bombay it was decided as there had been the delay at Bahrain the aircraft would proceed direct to Colombo, Sri-Lanka. On arrival we went to collect our two suitcases, one of which contained mostly disposable nappies. Our boy was not yet clean at night but ok during the day, for the duration of the trip of 17 days. However the other suitcase was soaking wet and must have been near the air leaking forward cargo door collecting condensation. The door seal hadn't been repaired in a satisfactory manner. The return journey was un-eventful but we were delayed in boarding as our flight was on a standby basis, but they found seats for us in the end. Oh, the vagaries of staff travel, but it has saved a fortune over the years, and you get to be upgraded into Club or First Class if lucky. Last year in August my wife and I visited RHS Wisley gardens for a day out. After leaving we drove down the A3 toward the M25 past Wisley Lake and thinking, the Pub and Hotel "The Hut" used to stand directly opposite Wisley Lake, around about where the A3 dual carriageway now runs. This was where most of the test pilots used to go for a well earned drink after flight trials. However we turned at the M25 junction to return to the site of the old Wisley Airfield, parked up and had a walk around. That's the first visit I've made to the site since 1974 by which time it had closed as an airfield. On that occasion the hangars were still standing, but completely empty of anything, heaters or office buildings etc. On this occasion, the hangars had been dis-assembled long ago. The apron areas are overgrown with weeds and small trees, as are the surroundings. 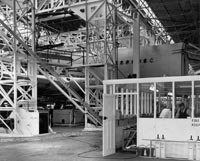 Hangar footprints are still visible, as are the extensions to those hangars for the VC10 programme, and hangar door rails are still in place. It was a strange feeling, thinking of ghosts from the past as several of my then ground crew colleagues are known to have passed on and a lot of others probably have, I was the youngest of them all. The runway at Wisley seen in more recent days. I could imagine all those noises of aircraft taking off or landing. The whine of engines starting or running down, taxi out, returning from flight. Waving off and waving in Vanguards and VC10s. The whine of BAC 1-11s starting up with their lower cowlings opened, with the noise detuners in the cowlings they sounded like a hundred banshees howling. Watching Vickers Supermarine Scimitars (carrier borne naval fighters of the era) coming and going during trials for inflight re-fuelling, sometimes with the Scimitar tanker's donor hose cone broken off on the receiving Scimitars refuelling lance. 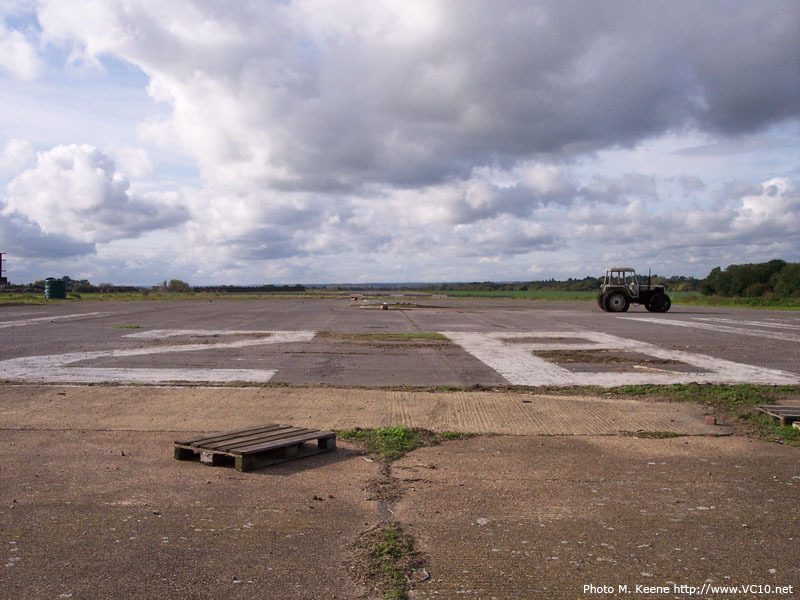 We took the opportunity to walk up the west end taxi way and onto the runway, which is now very much dilapidated over the years. We walked the whole length from west to east, something I had never done before when it was operational as you can imagine. Other than driving across the runway and getting clearance to drive along the grass to the compass swing bed for aircraft compass swings. A nice job on a sunny summers day. Walking up to the eastern end threshold and compass swing base. This is used by the farmer now for depositing animal manure and is only just visible. The non-magnetic base, which I believe was bronze, having been removed when the airfield closed down. The old control tower and flight crew base is no longer there, again just a footprint. Sad really for what the country had in aviation, never to be retrieved I'm afraid. And to bring my memoirs to a close, a list of firsts for the VC10 that I and other members of the ground crew that participated in the various trials experienced. Some that may be unique and perhaps that not everybody had considered at the time. I had not at the time or since, only to consider these events recently on the 50th Anniversary. G-ARTA 1st Standard VC10 to land at London Heathrow, January 1963. G-ARVB 1st flight beyond UK for any VC10, for 1st Tropical Trials at Torrejon Spain. 12th August 1963. 1st & probably only VC10 landing & take-off at Madrid Airport Spain. 12th August 1963. (BOAC I believe had no routes through Madrid, Spain in service at that time). 1st & only VC10 landing & take-off at Torrejon Nato Air Base at Torrejon (near Madrid) Spain. 12th August 1963. G-ARVB 1st VC10 flight beyond Europe 21st October 1963. G-ARVB 1st VC10 to over fly the Alps en-route to Cairo Egypt 21st October 1963. G-ARVB 1st VC10 to land & take off at Cairo Airport Egypt, 21st October/22nd October 1963. G-ARVB 1st & probably only VC10 to fly & follow the length of the Nile non-stop from Cairo to Johannesburg. 22nd October 1963. (I believe routes for service VC10s were from Rome Italy via Khartoum, Nairobi & Salisbury to Johannesburg). 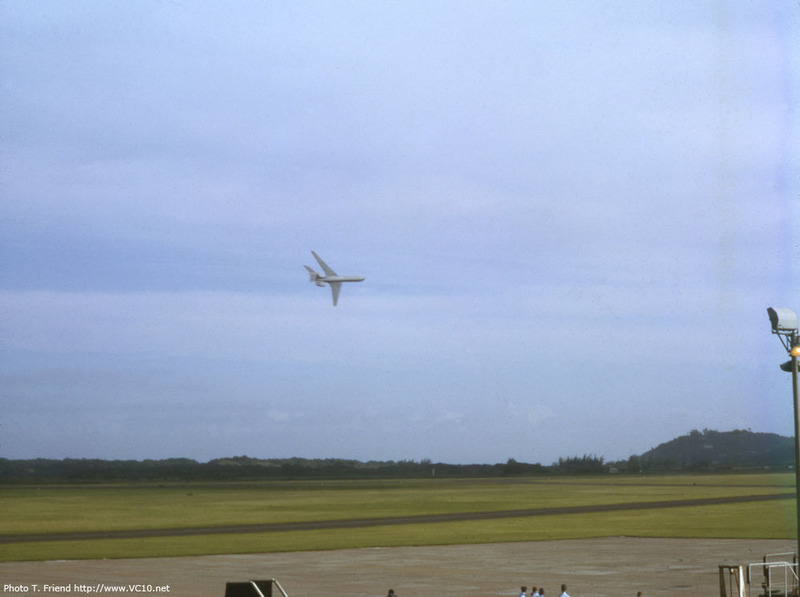 G-ARVB 1st VC10 to cross the equator on 22nd October 1963. 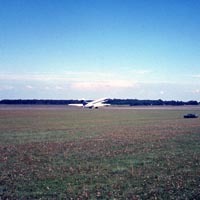 G-ARVB 1st VC10 to land & take-off at Jan Smuts Airport Johannesburg South Africa, 22nd October 1963 (Return date unknown). I cannot recollect what route we took for our return journey to the UK on this occasion. Maybe it was a direct flight from Jo'burg to Wisley, but I wouldn't have thought we had the range in a Standard, unless winds were favourable. G-ASGA 1st Super VC10 flight beyond Europe 27th November 1964. G-ASGA 1st Super VC10 to land & take-off at Khartoum Airport Sudan. 27th November 1964/7th December1964?. (no record of departure). G-ASGB 1st Super VC10 to land & take-off at London Heathrow Airport 8th January 1965. G-ASGB 1st & only VC10 to attempt London to Johannesburg direct flight 8th January 1965. G-ASGB 2nd & only Super VC10 to over fly the Sahara Desert en-route to Salisbury Southern Rhodesia 8th January 1965. 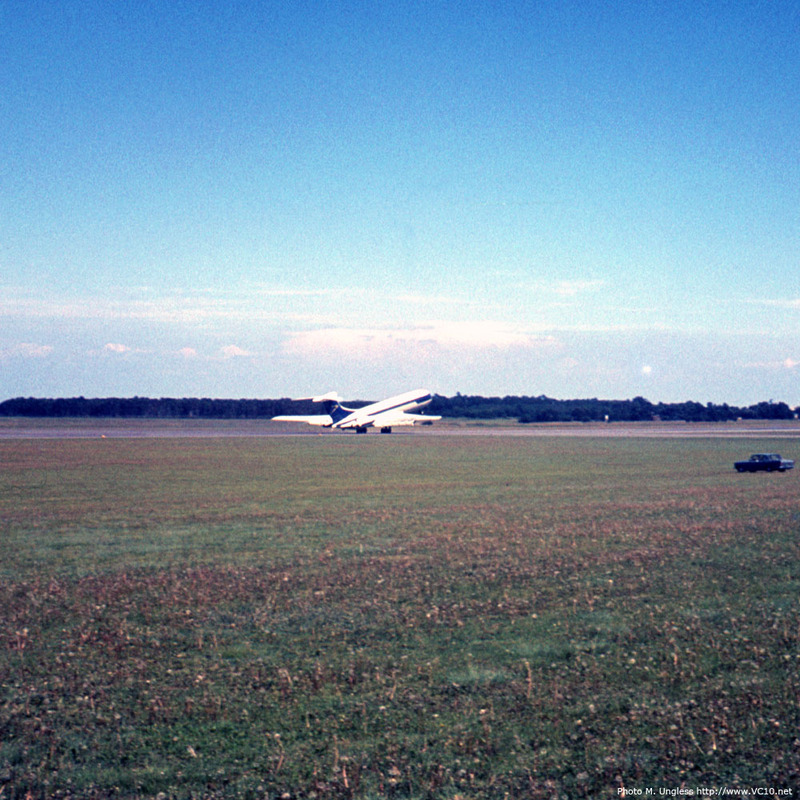 G-ASGB 1st Super VC10 to land & take-off at Salisbury Airport Southern Rhodesia 9th January 1965. 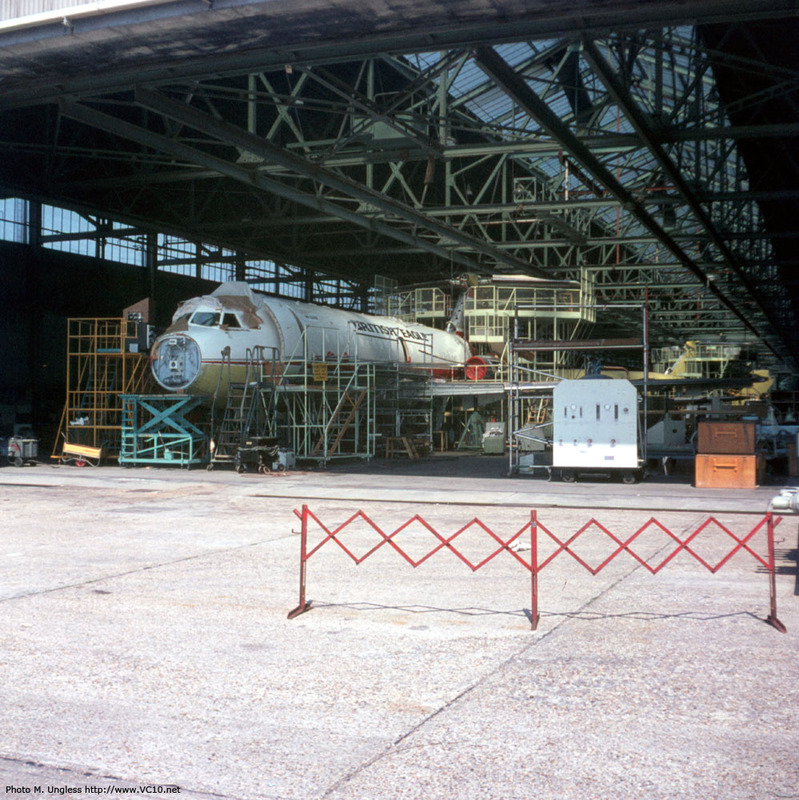 G-ASGB 1st Super VC10 to carry out Salisbury to Johannesburg sector flight, 9th January 1965. G-ASGB 1st Super VC10 to land & take-off at Johannesburg Jan Smuts Airport South Africa, 9th January/(No record of return date)? G-ASGB 1st VC10 to hold any speed record. 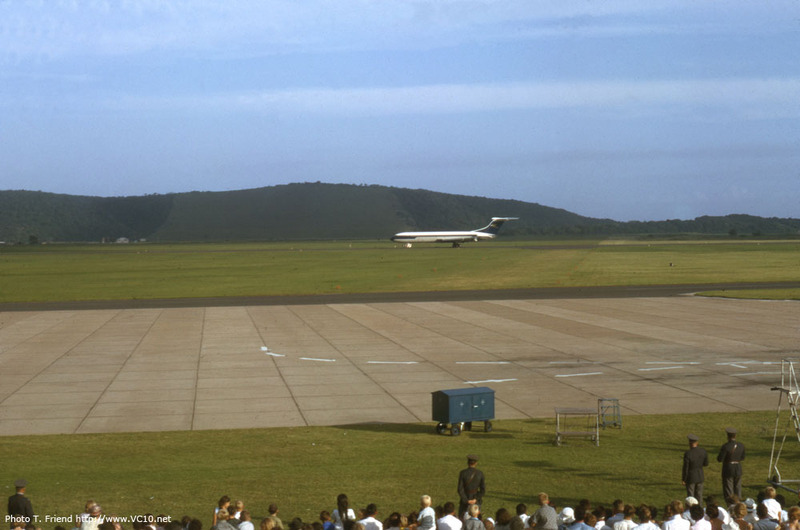 G-ASGB 1st & only VC10 to land & take-off at Durban Airport South Africa. (date unknown). G-ASGB 1st VC10 to fly over the Indian Ocean at any altitude, but also the only VC10 to fly at approximately 100 feet altitude above sea level, other than landing or take-off from a coastal airport..
G-ASGB 1st Super VC10 to fly Johannesburg/Nairobi sector and land on 3 engines. 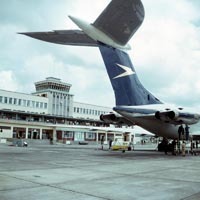 G-ASGB 1st Super VC10 to land & take-off at Nairobi Airport Kenya (date unknown). G-ASGB 1st & probably only VC10 to carry out a 4,240 mile ferry flight on 3 engines from Nairobi to UK (Wisley?) or maybe any routing. 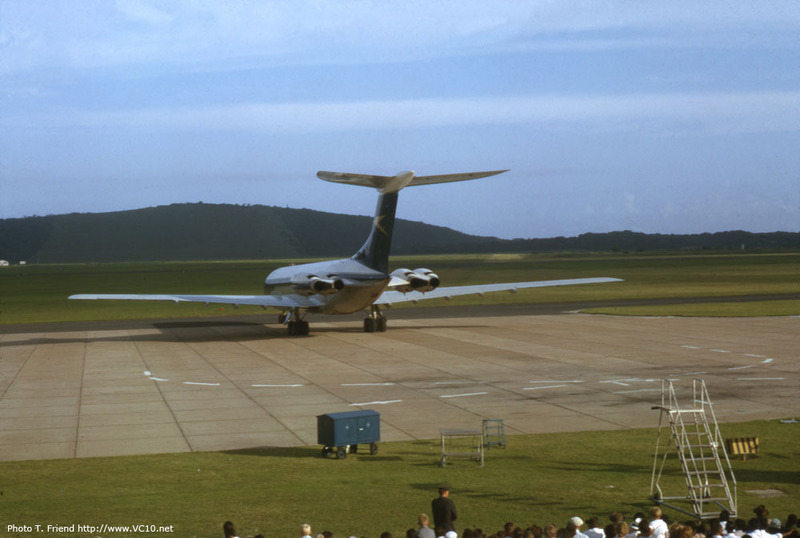 1st VC10 landing & take-off at Rolls Royce Hucknall Airfield. (date unknown). Probably would have been the only one but for the VC10 to be modified for the RB211 in-flight test programme which landed there in later years. Many firsts for the VC10 as a type, and all those onboard these flights and occasions. And finally I would like to dedicate my memoirs to all those fine participants who designed, constructed, maintained during flight trials and deliveries and tested one of the iconic airliners to be produced. Firstly, Sir George Edwards and his design team who remain nameless. 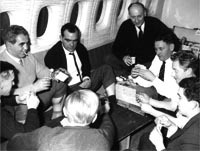 Secondly, the flight test crews who risked their lives in the pursuit of testing the VC10 for the safety of future passengers and crews. Bill Cairns, test pilot, who was third pilot/flight engineer on the first flight of the prototype VC10 G-ARTA on 29th June 1962. Who was the commander of all tropical trials carried out on the Standard and Super VC10. And who was second pilot to Brian Trubshaw on the majority of initial test flying including stall trials after Chief test pilot Jock Bryce transferred his attentions to the BAC 1-11. Jock Bryce, Vickers Armstrongs Chief test pilot who commanded the first flight of the VC10 G-ARTA with Brian Trubshaw as second pilot and Bill Cairns as third pilot/flight engineer. Brian Trubshaw, test pilot, second pilot to Jock Bryce on the first flight of the VC10 G-ARTA, who after Jock Bryce retired as Chief test pilot for Vickers Armstrongs/BAC became the Chief test pilot. Peter Baker, test pilot, I believe was the name of the second pilot to Bill Cairns on the tropical trials of the Standard VC10, to later transfer to the BAC 1-11 programme. John Cochrane test pilot, 2nd pilot to Bill Cairns for the Super VC10 tropical trials at Khartoum and Johannesburg. John Cochrane joined the VC10 programme midway through the VC10 flight test programme after serving with the RAF I believe as a Vulcan pilot. Later to accompany Brian Trubshaw in flight testing the Concorde. The nameless flight observers aboard the test aircraft during the flight trials period. Finally the aircraft engineers/mechanics I worked with from 1960 to 1966 in maintaining aircraft at Wisley, testing at Wisley or Boscombe Down or tropical trials and constructing at Weybridge, where I can remember their names, other figures not forgotten but names elude me, but if someone said "do you remember so and so", I'm sure I would recognise the name. Bill Oldfield, (leading hand/supervisor) : Colin Donaldson : Jack Wright : Bob Wright, (mechanical inspector) : Joe Lindsey : Eddy Cappel : John Randell : Eric Bennet : Ken Norridge (nogger) : Ron Bennet : Denis Wells : Toby Tobias : Denis Collier : Jack Pulfer (electrician) : Wally Davis (Wisley foreman) : Peter Walcotte : Denis Moller : Maurice Barney : Bill Rozier : Allan Burfield (Mechanical Inspector) : Min Covis (Electrician) : Bill Fagan (Mechanical Inspector) : And a few I can only remember by "nicknames", "Mogs" Moller : Dad Moller, yes there were 3 Mollers all related : "The Bone", a hairless leading hand with a reputation, hence the name : "Cheshire Cat" : Lenny (mums bum) : And there are many more, but the passing of time fogs the memory for names but not events and memories. 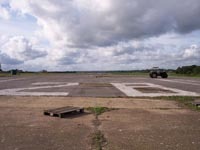 I should add that Maurice managed to create a very specific record in 2013: he may be the only person to personally have witnessed both the last take off of ZA150 from RAF Brize Norton as well as the final landing of this airframe at Dunsfold on 24th September 2013, driving down from Oxfordshire to Surrey while the VC10 was in the air.